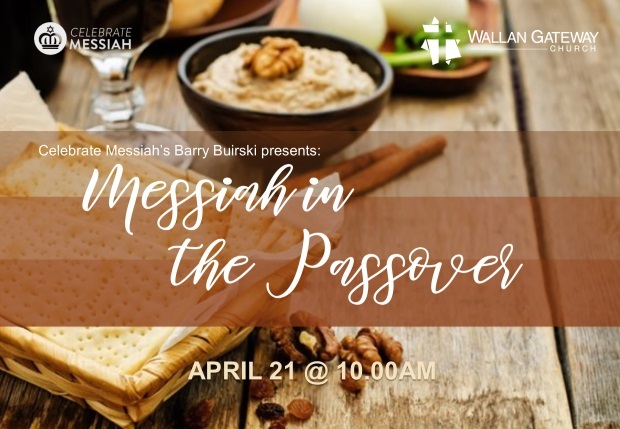 We are honoured to have Barry Buirski from Celebrate Messiah Australia, come and share with us on Resurrection Sunday. This presentation correlates the Jewish Passover and the Christian understanding of the Last Supper. It explores how “the Word became flesh” (John 1:14) at Passover, and deepens our understanding of Jesus’ life and ministry. A remarkable revelation of the deity of Jesus, and God’s master plan ofsalvation; and an evangelical tool for connecting with the Jewish people. We will also have a love offering collected for Barry on the day, and we encourage you to come prepared for this.